The sequel to Agamben’s Homo Sacer: Sovereign Power and Bare Life, State of Exception is the first book to theorize the state of exception in historical and philosophical context. In Agamben’s view, the majority of legal scholars and policymakers in Europe as well as the United States have wrongly rejected the necessity of such a theory, claiming instead that the state of exception is a pragmatic question. Agamben argues here that the state of exception, which was meant to be a provisional measure, became in the course of the twentieth century a normal paradigm of government. 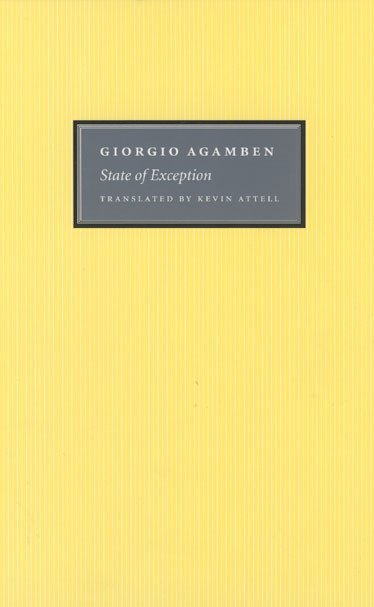 Writing nothing less than the history of the state of exception in its various national contexts throughout Western Europe and the United States, Agamben uses the work of Carl Schmitt as a foil for his reflections as well as that of Derrida, Benjamin, and Arendt. "When a conservative member of the U.S. Congress recently designated the Guantanamo prisoners as ’those who were missed by the bombs’ and thus forfeited their right to live, he almost literally evoked Agamben’s notion of homo sacer, a man reduced to bare life no longer covered by any legal or civil rights. What you hold in your hands is simply the book for all those who do not see in 9/11 a mere pretext for patriotic mobilization, but an impetus for a deeper reflection on where we stand today with regard to the very fundamentals of our civilization." "State of Exception is a timely and compelling inquiry into the capacity of state power to withdraw the guarantees of legal protection and entitlement, at once abandoning its subjects to the violent whims of law and intensifying state power. Not to be conceived as merely occasional and conditional, invocations of a state of exception have come to constitute the basis of modern state power. Agamben deftly considers the historical and philosophical implications of this power, offering a brilliant consideration of ’life’ and its tense relation to normativity. This is an erudite and provocative book that calls for us to ’stop the machine’ and break the violent hold that law lays upon life." "For Agamben, fingerprinting is not just a matter of civil liberties: it is symptomatic of an alarming shift in political geography. We have moved from Athens to Auschwitz: the West’s political model is now the concentration camp rather than the city state; we are no longer citizens but detainees, distinguishable from the inmates of Guantanamo not by any difference in legal status, but only by the fact that we have not yet had the misfortune to be incarcerated--or unexpectedly executed by a missile from an unmanned aircraft. . . . But although his recent examples come from the war on terror, the political development they represent is not, according to Agamben, peculiar to the United States under the Bush presidency. It is part of a wider range in governance in which the rule of law is routinely displaced by the state of exception, or emergency, and people are increasingly subject to extra-judicial state violence." "State of Exception is an impressive and disquieting meditation on the state of the democratic institutions by which political power is organised in the West. Written in a simple and lucid language, this is an erudite, meticulous, and precise examination of the long and complex history of the ideological framework underpinning the present obsession with the state of exception as the ’new form-of-state’ as it obtains at least in the USA and UK." "This book will likely be every bit as influential as [Agamben’s] previous texts. . . . An indispensable read for geographers and others interested in the spatiality of law and sovereign power." "The impact of Agamben’s thought since the publication of the first volume of Homo Sacer . . . has been immense not merely in the field of continental philosophy but also in political and legal theory, sociology, and in literary and cultural studies." "In Agamben’s work, one meets a vision that looks deeply into the well of human experience, and perceives there a turbulent and powerful interplay of political and social forces, all serving to shape and constitute--not only the social order and individual suhbjectivity--but also ’life’ at its most basic level." "A worthwhile addition to the burgeoning literature on mass violence."